TUCSON, Ariz.— Interior Secretary Ryan Zinke is the winner of the Center for Biological Diversity’s 2017 Rubber Dodo award. 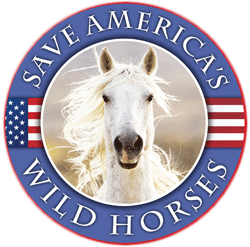 The statue is awarded each year to the person or group who has most aggressively sought to destroy America’s natural heritage or drive endangered species extinct. 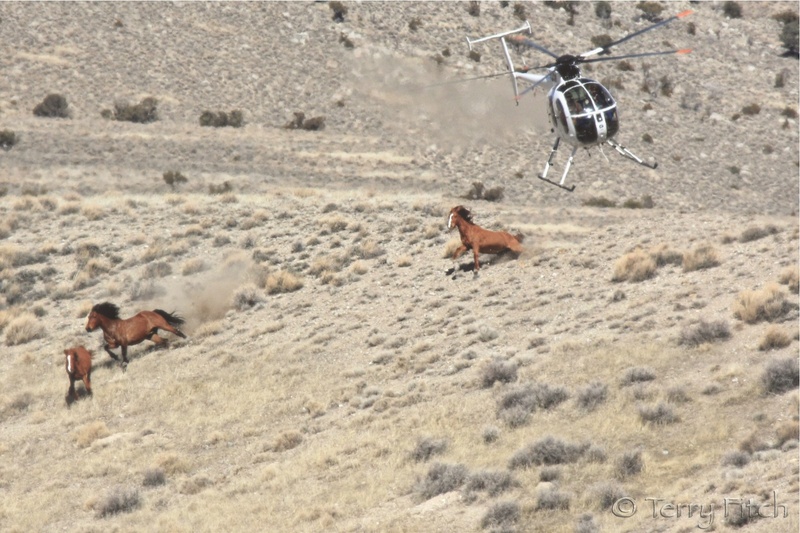 “Ryan Zinke seems to wake up every day wondering how he can tear apart America’s public lands, ramp up oil and gas development and put endangered species on a fast track to extinction,” said Kierán Suckling, the Center’s executive director. Zinke and President Trump announced massive cuts to Bears Ears and Grand Staircase-Escalante national monuments in Utah. Days later his Interior Department opened bids for the largest oil lease-sale ever offered in Alaska’s National Petroleum Reserve — potentially turning over more than 10 million acres of prime wilderness and wildlife habitat to oil development. Zinke’s Interior Department also proposed vastly ramping up offshore drilling in the Arctic, the Gulf of Mexico and along the West Coast and East Coast. If the plan is enacted, it could lead to more than 5,000 oil spills and contribute 49.5 gigatons of carbon dioxide pollution, the equivalent of the emissions from 10.6 billion cars driven for a year. He overturned President Obama’s moratorium on federal coal leasing and wants to open three marine monuments to industrial commercial fishing: Northeast Canyons and Seamounts in the Atlantic; Pacific Remote Islands; and Rose Atoll in the South Pacific. Zinke’s U.S. Fish and Wildlife Service this fall tried to roll back an Obama-era ban on trophy elephant imports from Zimbabwe; he has denied protections to species like the Pacific walrus. 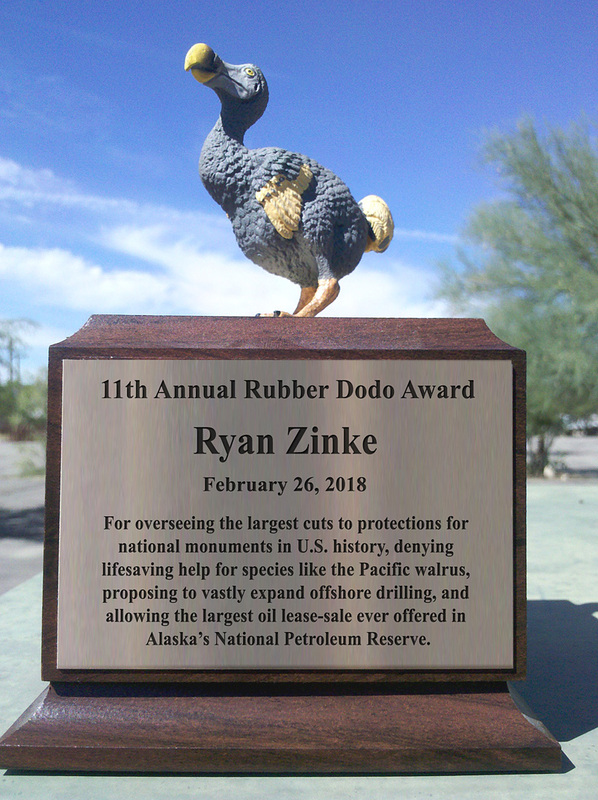 Zinke won the Rubber Dodo award after an online contest where tens of thousands of people were asked to choose between him, EPA Administrator Scott Pruitt, Rep. Rob Bishop (R-Utah) and Sonny Perdue, head of the U.S. Department of Agriculture. Previous Rubber Dodo award winners include Rep. Rob Bishop (2016), Monsanto (2015), the U.S. Department of Agriculture’s Wildlife Services (2014), the Koch brothers (2013), climate denier Senator James Inhofe (2012), the U.S. Chamber of Commerce (2011), former BP CEO Tony Hayward (2010), massive land speculator Michael Winer (2009), Alaska Gov. Sarah Palin (2008) and Interior Secretary Dirk Kempthorne (2007). In 1598 Dutch sailors landing on the Indian Ocean island of Mauritius discovered a flightless, 3-foot-tall, extraordinarily friendly bird. Its original scientific name was Didus ineptus. (Contemporary scientists use the less defamatory Raphus cucullatus.) To the rest of the world, it’s the dodo — possibly the most famous extinct species on Earth after the dinosaurs. It evolved over millions of years with no natural predators and eventually lost the ability to fly, becoming a land-based consumer of fruits, nuts and berries. Having never known predators, it showed no fear of humans or the menagerie of animals accompanying them to Mauritius. Its trusting nature led to its rapid extinction. By 1681 the dodo had vanished, hunted and outcompeted by humans, dogs, cats, rats, macaques and pigs. Humans logged its forest cover while pigs uprooted and ate much of the understory vegetation. The dodo’s reputation as a foolish, ungainly bird derives in part from its friendly naiveté and the very plump captives that were taken on tour across Europe. The animal’s reputation was cemented with the 1865 publication of Lewis Carroll’s Alice’s Adventures in Wonderland. Based on skeleton reconstructions and the discovery of early drawings, scientists now believe that the dodo was a much sleeker animal than commonly portrayed. The rotund European exhibitions were likely produced by overfeeding captive birds. I have to admit, I’m in perfect agreement with thousands of others that this epitome of self informed ignorance and callous disregard makes him the perfect winner of this award. It sure was a tough choice – between Zinke, Pruitt, Bishop & Purdue! 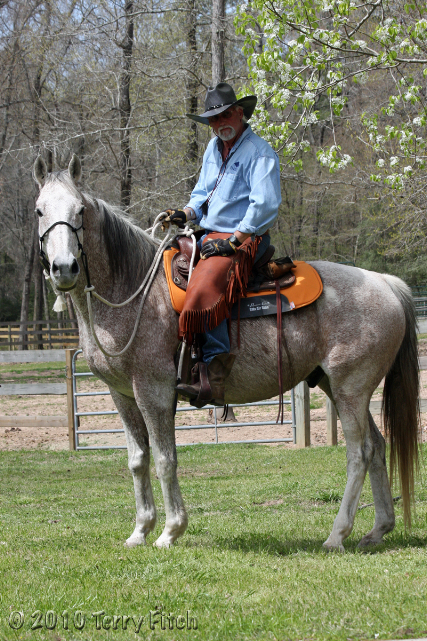 But on quantity of destruction, Zinke does come out on “top”. The others are trying but hes the winner in this race. Too bad this bird has to be mentioned in the same breath as the evil public lands destroyer. Interior Secretary Zinke asked for confidential energy data. So two scientists left. Definition: Insider trading is defined as a malpractice wherein trade of a company’s securities is undertaken by people who by virtue of their work have access to the otherwise non public information which can be crucial for making investment decisions. Speaking Tuesday to a major energy-industry conference, Zinke described the Trump administration’s efforts to increase offshore drilling, reduce regulations, and streamline inspections of oil and gas operators. “Interior should not be in the business of being an adversary. We should be in the business of being a partner,” Zinke said to a receptive audience that included leaders of energy companies and oil-producing countries. Zinke said the government should shorten the permitting process for energy infrastructure — it shouldn’t take longer than two years. “If you ask an investor to continuously put money on a project that is uncertain because the permit process has too much uncertainty, ambiguity, (it) is quite frankly un-American,” he said. The Interior Department manages 500,000 million acres — one-fifth of the U.S. land mass — as well as the lease of offshore areas for oil drilling. One-fifth of U.S. oil production takes place on land or water that the Interior Department leases to private energy companies. Environmentalists accuse Zinke and the administration of undercutting environmental rules to help oil, gas and coal companies. In January, the Trump administration proposed to open up nearly all coastal areas to oil drilling, although Florida was dropped after the Republican governor and lawmakers objected, citing risk to the state’s tourism business.